Sustainable tropical fruit grower-distributor One Banana has released the results of its sustainability programmes for 2017, highlighting the progress of its Living Wage programme, which aligns with the UN Sustainability goal number one - to eradicate poverty in all of its forms. According to One Banana, a leader in socially responsible and environmentally sustainable farming with operations across the US, Guatemala, Europe, Peru and Ecuador, the Living Wage programme defines the income that an individual requires to support his/her family at a given moment and in a specific place to allow that individual to live a full and decent life. The concept of a Living Wage, which was calculated and established through a study conducted in the south-west region of Guatemala, goes beyond that of a minimum wage, which covers only basic subsistence needs. In December 2017, One Banana average wages exceeded the living wage in Guatemala by 16 per cent and exceeded Guatemala’s per capita GDP by 81 per cent. “This research effort and its outcomes have made it possible for us to better understand the sociocultural reality of our workers and their families and to determine the direction and approach of our sustainable development projects,” said Robert Adams, president of One Banana. 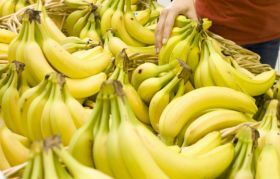 Jorge Giovanni Casimiro López, who has worked for One Banana for the past fourteen years, praised the company for its vision and commitment to the community. “Because they pay more than just the minimum wage I’ve been able to provide for my family, send my children to school, own my own home, and buy myself a motorcycle for transportation,” said López. “None of this was possible in any of my previous jobs.